Annan consolidated their top 4 position with an important victory single goal victory over Queens Park in a match played in challenging conditions at Galabank. Both teams deserve huge credit for providing the fans with entertainment played under farcical conditions as the forerunner to Storm Freya battered the South West of Scotland with the driving rain and howling gale making it almost impossible at times for the players. Annan boss Peter Murphy made changes from the team which scraped through in the mid week fixture at Berwick with the Annan fans seeing for the first time Aidan McAdams who took over in goal from Alex Mitchell, Chris Johnston started the game wide on the right and the in form Aidan Smith and Christain Nade were given the go ahead up front. Queens Park off the back of an impressive mid week 2-2 draw up at Elgin City and boss Mark Roberts was forced to make one change with the injured Scott McLean position being taken by Billy Mortimer. Gerry McLauchlan was still not available at the centre of defence. Queens Park won the toss and Annan played up the park with the wind and rain in their favour but it was the visitors who settled into the elements with David Gault being first to try his luck in the 12th minute with a shot which flashed past the post. This was followed by a Kieran Moore header from a corner in the 15th minute. 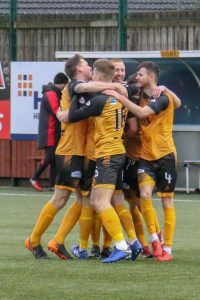 Annan had their first concerted attack in the 22nd minute, and there was no surprise when it was a long, wind-assisted Lewis Strapp throw in that caused alarm in the Spiders rearguard but the final effort went past the post. Minutes later Annan struck gold when the ball was played wide to Chris Johnston who picked out the unmarked Tony Wallace at the back post who headed into the empty net from 4 yards. Queens Parks task was then dealt a blow when they lost the services of Billy Mortimer who fell awkwardly after a stern challenge by Aidan Smith which resulted in the Queens Park man being stretchered off. Grant replaced Mortimer and the visitors and as the match approached half time the visitors were unlucky in the 37th minute when Lewis Hawke was put through but Hawke’s first touch took him wide of the target and his final effort across the face if the goal was scrambled clear by Scott Hooper. With the wind at their backs, Queen’s were expected to apply early pressure on Annan but unfortunately, it was the opposite that happened and Annan began the second half in a more determined mood taking control of possession and the Queens Park defence had to be alert as they faced a number of corners and free-kicks. Jamie McKernon made a timely interception to deny Wallace as Annan searched for the goal which would have given them some breathing space. Annan also made a couple of substitutions as they pressed forward, replacing Nade and Bradley with Muir and Moxon. They almost made it two when Scott Gibson threw himself bravely in the path of a goal bound shot. Gibson cleared the effort at the expense of a corner and a blow to the head which saw the player receiving treatment. Annan were looking the team more likely to score and in the 74th minute they struck again, Hooper making a penetrating run down the right to the bye line finishing with a dangerous inviting cross to the back post and once again it was Tony Wallace at hand to head the ball over the line form one yard. As the rain lashed down Queens Park’s task look bleak but when Alan Gow was introduced at the expense of Moore their fortunes were given a boost. And within a couple of minutes of the introduction David Galt picked up a loose McAdams clearance ball to finish with a curling shot into the corner of McAdams’ net to give Queens Park hope of a comeback. The Spiders battled to get back on terms, but never really put McAdams under serious pressure until deep into injury time. Hawke chased down a ball on the left and managed to get it across to Gow but his effort was blocked right at the death with it Queens Park chances of securing a late equaliser. Queen’s Park: Jordan Hart, Ciaran Summers, William Mortimer (James Grant 33 min), Jamie McKernon, Dominic McLaren, Scott Gibson, Calvin McGrory, Kurtis Roberts ( Steven Bradley 79 min), Lewis Hawke, David Galt, Kieran Moore ( Alan Gow 75 min) . Subs Not Used , Josh Peters, Euan East , Lewis Magee, Kieran McDougall GK. Annan Athletic –Aiden McAdams, Scott Hooper, Lewis Strapp, David Wilson, Peter Watson, Steven Swinglehurst, Tony Wallace, Kyle Bradley ( Owen Moxon 67 min ) , Aidan Smith, Christain Nade ( Tommy Muir 60 minutes ), Chris Johnston . Subs not used Alex Mitchell GK, James Creaney , Ross Ferguson, , Ayrton Sonkur, Peter Murphy. Referee – Barry Cook​​Assistants – John McCrossanand Gary Logan. In the other games played in SPFL2 Peterhead consolidated their position at the top of the league with a single goal victory over Elgin City. Clyde lifted all the points in a 1-0 victory over Edinburgh City. Stirling Albion lifted all the points in a 2-1 victory at Cowdenbeath and finally Berwick Rangers and Albion Rovers shared the points in a 1-1 draw. There are a couple of mid week games scheduled with Cowdenbeath entertaining Peterhead and Edinburgh City entertaining Berwick Rangers .